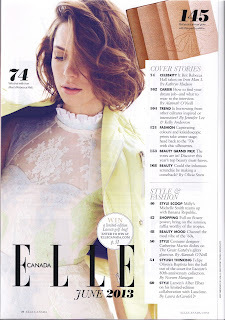 If you told me last year that my name would be mentioned in an issue of Elle Magazine, I would have probably smiled, looked to the right, and thought "That would be amazing." If you told me this same thing 5 years ago when I was deep in the mix of writing my doctoral dissertation on fashion (and heavily critiquing fashion magazines in the process), I would have thought you had lost your mind. Ten years ago? I would have inquired what you were smoking. In general, mainstream fashion magazines have historically shown little interest in featuring alternative perspectives on the fashion industry. The bodies represented in fashion magazines are overwhelmingly homogeneous. 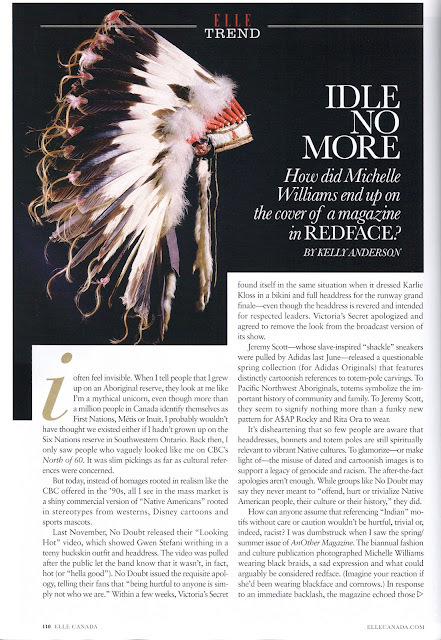 If fashion editors include anything 'Indigenous' within their pages, it is presented from a distinct non-Native perspective that is hell-bent on exoticizing those who are the least 'foreign' to this land. Readers are encouraged to "Go Native" with the assumption that you are not Native American (forms of exclusion), and that you can don some feathers and tribal prints to effectively become Native. Meanwhile, the tribal trend party is closed to Native American or First Nations fashion designers or models, and the elitism of the fashion industry is reinforced. So when I heard that Elle Canada had two articles in their June 2013 issue that discuss cultural appropriation in fashion, I was thrilled. Under their 'Trend' cover stories section, two authors take on misappropriation when it comes to Asian- and Native-inspired fashion. Kelly Anderson, who grew up on the Six Nations reserve in Ontario recounts a truth that is known by many: when it comes to cultural references in mass media, minorities are all too often ignored, excluded, and/or misrepresented. She calls out No Doubt, Karlie Kloss, Jeremy Scott, Michelle Williams, and Paul Frank. Instead of advertising their products, which we are accustomed to seeing in fashion magazines, Anderson highlights where they went wrong. Through a direct approach, she explains how these indiscretions are part of a bigger problem related to historic and contemporary racism and oppression. Adrienne Keene and I get a nice shout out for our work in critiquing this 'trend,' but we are only a small part of a larger movement to critique stereotypes and reclaim our right to self-representation. 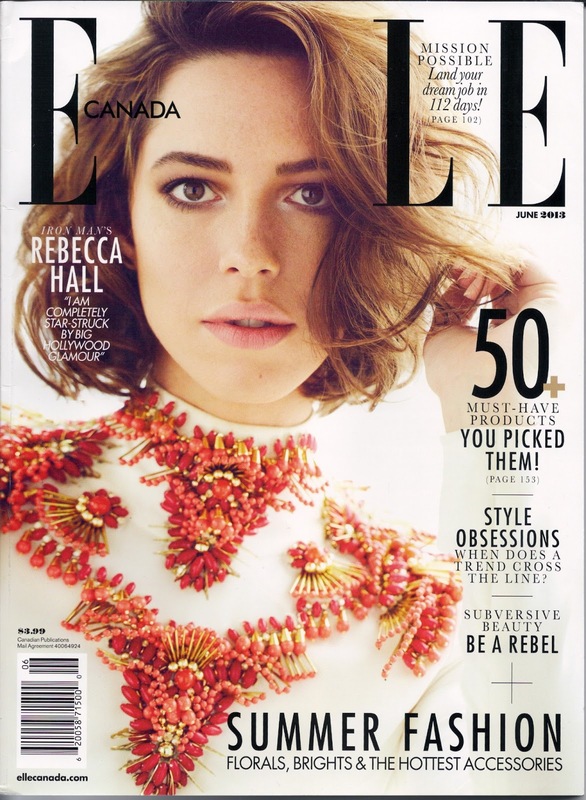 Pick up your issue of Elle Canada now, or click here to read the article online.